I bought a bottle of this at Utobeer located in Borough Market and was very much looking forward to getting home and cracking it open. 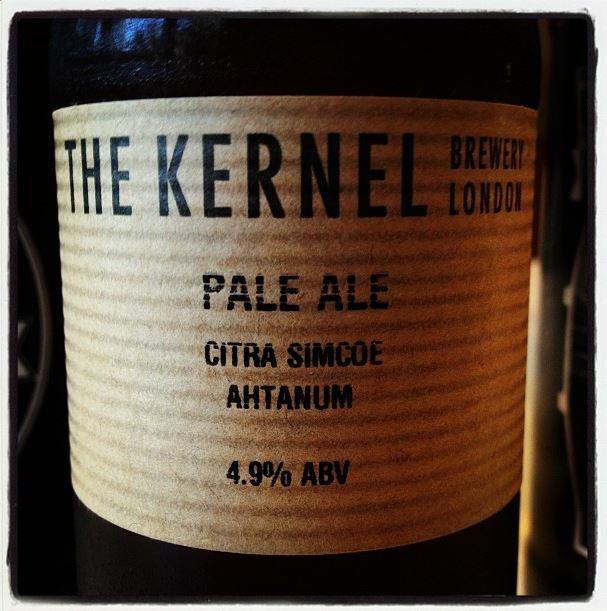 I’d heard some really good things about the Kernel Brewery in London – so expectations were very high. They’ve brewed quite a few Pale Ale’s with varying types of Hops being used for each batch – this particular Pale Ale was brewed using Citra, Simcoe and Ahtanum Hops with a 4.9% ABV. I wanted to get straight in there – but because of quite a bit of sediment it was recommended to leave it for a few hours upright in the fridge – which I did for a little while. Finally I got to pour it – in the glass its appearance was hazy pale amber and still slightly cloudy from the sediment – with a white bubbly head. It was perhaps my expectations that it was up against – and it was also up against stiff competition and cleaner more balanced pale ales – I’m therefore awarding it with 3 stars – and look forward to trying more beers from this brewery – they obviously have some talent!